Brunei joined ASEAN on 7 January 1984, one week after resuming full independence, and gives its ASEAN membership the highest priority in its foreign relations. Brunei joined the United Nations in September 1984. It also is a member of the Organisation of Islamic Cooperation (OIC), the Asia-Pacific Economic Cooperation (APEC) forum and the Commonwealth of Nations. Brunei hosted the APEC Economic Leaders' Meeting in November 2000. In 2005 it attended the inaugural East Asia Summit. Brunei has a number of diplomatic missions abroad and has close relations with Singapore, sharing an interchangeable currency regime as well as close military relations with the latter island-state. Aside from relations with other ASEAN states, of which the Philippines, Indonesia, and Malaysia are key partners, Brunei also has extensive relations with the Islamic and Arab world outside its region. Brunei became a member state of the United Kingdom Commonwealth in 1984, ASEAN, the United Nations and the Organisation of Islamic Cooperation) in 1984, the Organisation of Islamic Cooperation, a major player in BIMP-EAGA in 1994., a founding member of the World Trade Organization (WTO) in 1995, Since 2009 Brunei and the Philippines signed a Memorandum of Understanding (MOU) that seeks to strengthen the bilateral co-operation of the two countries in the fields of agriculture and farm-related trade and investments. Brunei has been a fully independent member state of the Commonwealth of Nations since 1 January 1984, when it regained independence, having been under British protection and suzerainty since 1888. 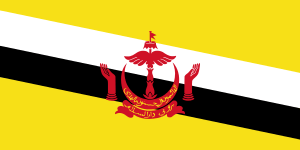 Brunei is, along with Lesotho, Malaysia, Swaziland, and Tonga, a monarchy with its own monarch, the Sultan of Brunei. Bruneians can take an appeal to the Judicial Committee of the Privy Council in London in civil cases only. The Judicial Committee of the Privy Council reports back to the Sultan in cases originating from the courts of Brunei. Australia and Brunei Darussalam enjoy a warm, and increasingly diverse bilateral relationship. Australian servicemen liberated Brunei from Japanese occupation in June 1945. A memorial marking this event can be found at Muara Beach and is the venue for the annual ANZAC Day ceremony organised by the High Commission. Both countries are also participating in the Trans Pacific Partnership (TPP) negotiations which commenced in 2010, with participants aiming to conclude an agreement which will serve as a building block for Asia Pacific economic integration. Brunei has a high commission in Canberra, and Australia has a high commission in Bandar Seri Begawan. Both countries are full members of the Commonwealth of Nations. Relations between the two countries were established in 1984 when Australia became one of the first countries to establish diplomatic relations with Brunei. Bilateral relations are excellent between the two predominantly moderate Muslim nations. They are both members of OIC, the Commonwealth and NAM and share common views on regional and international issues. Brunei recognised Bangladesh quickly with other Southeast Asian countries and Bangladesh established a residential High Commission in 1985, although it was closed down from 1988 to 1997 due to financial constraints. Brunei has a High Commission located in Dhaka. Brunei actively supports Bangladesh's candidacy for different regional and international organisations. Brunei has an embassy in Yangon, and Burma has an embassy in Gadong. Relations were established on 21 September 1993. Brunei has an embassy in Phnom Penh, and Cambodia has an embassy in Bandar Seri Begawan. Relations were established on 9 June 1992. Canada established diplomatic relations with Brunei Darussalam on 7 May 1984, following Brunei's independence. Brunei has a High Commission in Ottawa, and Canada has a High Commission in Bandar Seri Begawan. Like Brunei, Canada is a full member of the Commonwealth of Nations. Brunei has an embassy in Beijing, and China has an embassy in Bandar Seri Begawan. Relations can be traced back to over 2,000 years ago as early as the Western Han periods. Brunei has an embassy in Paris, and France has an embassy in Bandar Seri Begawan. Relations between the two countries has been established since 8 May 1984. Brunei has an embassy in Berlin, and Germany has an embassy in Bandar Seri Begawan. Relations between the two countries has been established since 1 May 1984. Brunei has a High Commission in New Delhi, and India has a High Commission in Bandar Seri Begawan. Both countries are full members of the Commonwealth of Nations. Relations have been established since 10 May 1984. Republic of Indonesia established diplomatic relations with Brunei Darussalam on 1 January 1984. Brunei Darussalam was recognised by Jakarta on independence in 1984, with Indonesia dropping any claims on the Sultanate in the process. Brunei has an embassy in Tokyo, and Japan has an embassy in Bandar Seri Begawan. Relations were established on 2 April 1984. Brunei has an embassy in Vientiane, and Laos has an embassy in Bandar Seri Begawan. Relations were established on 27 July 1993. Both countries established diplomatic relations since January 1984 with Brunei has a High Commission in Kuala Lumpur, and Malaysia has a High Commission in Bandar Seri Begawan. Like Brunei, Malaysia is a full member of the Commonwealth of Nations. The Bruneian High Commission in Kuala Lumpur is accredited to New Zealand, while the New Zealand High Commission in Kuala Lumpur is cross-accredited to Brunei. Relations has been established since 5 May 1984 and have always been friendly and positive with such co-operation in education trade and defence. In August 2013 Brunei's Foreign Affairs and Vice-Minister, Prince Mohamed Bolkiah arrived in Pyongyang. Brunei is represented in North Korea, through its embassy in Kuala Lumpur, Malaysia. Brunei has an embassy in Muscat, and Oman has an embassy in Bandar Seri Begawan. Relations has been established since 24 March 1984. Pakistan has a High Commission in Bandar Seri Begawan and Brunei has a High Commission in Islamabad. Pakistan initially hesitated to recognise the country at first since its close relations with Malaysia which what they considered as part of the Federation of Malaysia but later established relations on 9 February 1984 when Malaysia established relations with the country. Brunei has an embassy in Doha, and Qatar has an embassy in Bandar Seri Begawan. Relations between the two countries has been established since 2 October 1991. Brunei maintains an embassy in Moscow, the Russian embassy in Brunei was established in March 2010. The official relations between the two countries has been established since 1984. Brunei and Singapore agreed to have Singapore train its armed forces with Brunei. Like Brunei, Singapore is a full member of the Commonwealth of Nations. Brunei and Singapore have a currency agreement that the currencies of both countries can be used in either of the two countries. The Brunei dollar and the Singapore dollar are maintained at par. In August 2005, Brunei's Foreign Affairs and Trade Minister, Prince Mohamed Bolkiah arrived in Singapore for a three-day visit during which the two countries signed an agreement to eliminate double taxation, paving the way for further bilateral trade and investment. The Royal Brunei Navy and the Republic of Singapore Navy conduct an annual Exercise Pelican signifying strong ties between the two navies. Brunei has an embassy in Seoul South Korea, which has an embassy in Bandar Seri Begawan. South Korea established diplomatic relations with Brunei on 1 June 1984 right after the country gained independence from the United Kingdom on 1 January on that year. Brunei has an embassy in Bangkok, and Thailand has an embassy in Bandar Seri Begawan. The relations have always been close and cordial. In 1888, Brunei became a British protectorate, gaining its independence from British protection less than 100 years later in 1984. The US welcomed Brunei Darussalam's full independence from the United Kingdom on 1 January 1984, and opened an embassy in Bandar Seri Begawan on that date. Brunei opened its embassy in Washington, D.C. in March 1984. Brunei's armed forces engage in joint exercises, training programs, and other military co-operation with the USA memorandum of understanding on defence co-operation was signed on 29 November 1994. The Sultan of Brunei visited Washington in December 2002. Relations between the two countries has been established since 29 February 1992. Brunei has an embassy in Hanoi, and Vietnam has an embassy in Bandar Seri Begawan. Relations between the two countries have always been friendly especially in the political field. ↑ "MOFAT, Commonwealth". Ministry of Foreign Affairs and Trade of Brunei Darussalam. 30 March 2010. Archived from the original on 28 January 2010. ↑ "US DOS" (30 March 2010). "MOFAT, UN". Ministry of Foreign Affairs and Trade of Brunei Darussalam. Archived from the original on 18 February 2008. ↑ "MOFAT, OIC". Ministry of Foreign Affairs and Trade of Brunei Darussalam. 30 March 2010. Archived from the original on 18 June 2008. ↑ "MOFAT, BIMP-EAGA". Ministry of Foreign Affairs and Trade. 30 March 2010. Archived from the original on 21 June 2008. ↑ "MOFAT, WTO". Ministry of Foreign Affairs and Trade. 30 March 2010. Archived from the original on 25 June 2008. 1 2 "Australia-Brunei Relations". Ministry of Foreign Affairs and Trade (Brunei). Retrieved 20 February 2014. ↑ Jatswan S. Sidhu (22 December 2009). Historical Dictionary of Brunei Darussalam. Scarecrow Press. pp. 29–. ISBN 978-0-8108-7078-9. ↑ "Sultan of Brunei heading to Australia". The Australian. 29 April 2013. Retrieved 20 February 2014. 1 2 "Brunei-Burma Relations". Ministry of Foreign Affairs and Trade (Brunei). Retrieved 4 February 2014. 1 2 "Brunei-Cambodia Relations". Ministry of Foreign Affairs and Trade (Brunei). Retrieved 5 February 2014. ↑ "Brunei-Canada Relations". Ministry of Foreign Affairs and Trade (Brunei). Retrieved 15 February 2014. 1 2 "Canada-Brunei Darussalam Relations". Government of Canada. November 2013. Retrieved 15 February 2014. ↑ "Brunei-China Relations". Ministry of Foreign Affairs and Trade (Brunei). Retrieved 17 February 2014. ↑ Prashanth Parameswaran (9 November 2012). "China, Brunei: ties that bind". Asia Times Online. Retrieved 17 February 2014. 1 2 "Brunei-France Relations". Ministry of Foreign Affairs and Trade (Brunei). Retrieved 13 February 2014. 1 2 "Brunei-Germany Relations". Ministry of Foreign Affairs and Trade (Brunei). Retrieved 14 February 2014. ↑ "Germany and Brunei Darussalam (Bilateral relations)". German Embassy in Bandar Seri Begawan. Retrieved 14 February 2014. 1 2 "Brunei-India Relations". Ministry of Foreign Affairs and Trade (Brunei). Retrieved 17 February 2014. ↑ "Brunei-Indonesia Relations". Ministry of Foreign Affairs and Trade (Brunei). Retrieved 4 February 2014. 1 2 "Brunei-Japan Relations". Ministry of Foreign Affairs and Trade (Brunei). Retrieved 16 February 2014. 1 2 "Brunei-Laos Relations". Ministry of Foreign Affairs and Trade (Brunei). Retrieved 7 February 2014. ↑ "Brunei-Malaysia Relations". Ministry of Foreign Affairs and Trade (Brunei). Retrieved 4 February 2014. ↑ "Brunei-New Zealand Relations". Ministry of Foreign Affairs and Trade (Brunei). Retrieved 21 February 2014. ↑ "Brunei-New Zealand (Bilateral links)". Ministry of Foreign Affairs and Trade (New Zealand). Retrieved 21 February 2014. 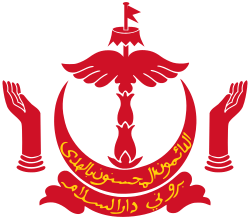 1 2 "Brunei-Oman Relations". Ministry of Foreign Affairs and Trade (Brunei). Retrieved 22 February 2014. ↑ "Brunei-Pakistan Relations". Ministry of Foreign Affairs and Trade (Brunei). Retrieved 4 February 2014. ↑ "Brunei-Philippines Relations". Ministry of Foreign Affairs and Trade (Brunei). Retrieved 8 February 2014. ↑ "RP, Brunei sign farm-cooperation deal"
↑ "RP, Brunei seal agricultural cooperation deal"
↑ "RP, Brunei agree to strengthen bilateral ties in agriculture"
1 2 "Brunei-Qatar Relations". Ministry of Foreign Affairs and Trade (Brunei). Retrieved 24 February 2014. ↑ "Brunei-Singapore Relations". Ministry of Foreign Affairs and Trade (Brunei). Retrieved 8 February 2014. ↑ "Singapore, Brunei sign Avoidance of Double Taxation pact". Channel NewsAsia. 19 August 2005. 1 2 "Brunei-South Korea Relations". Ministry of Foreign Affairs and Trade (Brunei). Retrieved 15 February 2014. ↑ Na Jeong-ju (31 May 2009). "Brunei Seeks Stronger IT Partnership With Seoul". The Korea Times. Archived from the original on 5 July 2015. Retrieved 15 February 2014. ↑ "Brunei-Thailand Relations". Ministry of Foreign Affairs and Trade (Brunei). Retrieved 9 February 2014. ↑ Oxford Business Group (2011). The Report: Brunei Darussalam 2011. Oxford Business Group. pp. 36–. ISBN 978-1-907065-52-1. ↑ "Brunei-United Kingdom Relations". Ministry of Foreign Affairs and Trade (Brunei). Retrieved 14 February 2014. 1 2 "Brunei-Vietnam Relations". Ministry of Foreign Affairs and Trade (Brunei). Retrieved 12 February 2014. ↑ "VIETNAM – BRUNEI DARUSSALAM RELATIONS". Embassy of the Socialist Republic of Vietnam in Brunei Darussalam. Retrieved 12 February 2014.